Every journalist’s dream is to have a story on the front page. For some, it may take years of reporting and stories hidden within the paper before getting to see their byline on the first page of a major newspaper. For FIU seniors Barbara Corbellini Duarte and Brittny C. Valdes, however, it didn’t take very long. 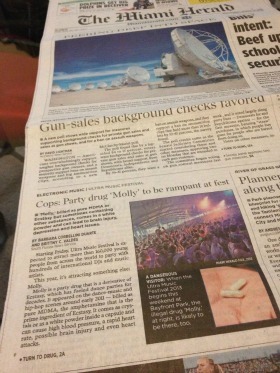 The students’ story, featured on the front page of the Miami Herald, focused on the drug “Molly” and its use at the upcoming Ultra Music Festival. On Wednesday, March 13, 2013, Corbellini and Valdes landed on the 1A section of the Miami Herald with their investigative piece on the drug “Molly,” which they report, is being consumed in greater quantities, especially during the various music events happening during Miami Music Week. “Molly has gradually become one of Miami’s most popular drugs. During Ultra Music Festival, hundreds of people ingest it. This article is intended to raise awareness about the drug and shed light on exactly what Molly is,” Valdes said. The front-page article, which was the top story on the Miami Herald’s website on Wednesday, was also a first-time success for the South Florida News Service (SFNS), an online publication that gives FIU journalism students the opportunity to publish stories in South Florida newspapers such as the Sun Sentinel, the Palm Beach Post and the Miami Herald. The program, led by news director Chris Delboni, has managed to turn the classroom into a newsroom since its inception in 2009. Students work closely with Delboni, from developing story ideas to reporting and editing, before local newspapers pick up the stories. “One of our challenges was to build a cycle of student-reporters who could deliver different types of stories, from hyper-local to in-depth and investigative. ‘Molly’ is the first accomplishment on the high end. I am very proud of Barbara and Brittny,” Delboni said. Duarte and Valdes, who have published other stories separately through the SFNS, worked closely for several months before making page one. “We started the story in November of last year. We knew the story had potential and we knew no one had reported on it yet, at least on the papers. But it had many challenges,” Duarte said. “At one point we even questioned if we were ever going to be done with the story, because with every edit there was more reporting that needed to be done,” added Valdes. In the end, with support from Delboni and Joan Chrissos, the suburban and health editor at the Miami Herald and the editor overseeing the SFNS, Duarte and Valdes were able to complete their story and see their name on the front page for the first time. 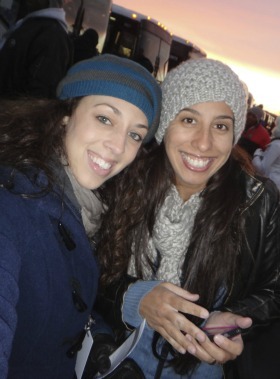 Brittny C. Valdes, left, and Barbara Corbellini Duarte were part of a six-student team that covered the presidential inauguration in Washington, D.C.
“Through their persistence, tenacity and old-fashioned shoe-leather reporting, they uncovered an important story detailing a new drug, Molly, that is likely to be rampant at Ultra…Their story is a must-read for every parent and person going to Ultra,” said Chrissos. This past January, a team of SFNS reporters (including both Duarte and Valdes) traveled to Washington, D.C. to cover the presidential inauguration, and in February the website was chosen among the top three best independent student publications by the Society of Professional Journalists Region 3. First place will be announced shortly and will go on to compete for the national award in the same category. The next goal of the news service is to become global, publishing stories in Spanish and Portuguese and working with media outlets at a national and international level, all with the intention to provide journalism students with real newsroom experience and in-depth reporting skills. “I believe the SFNS transformed the School of Journalism and Mass Communication, and for sure the SFNS changed my life. I would not be the same journalist I am today if I hadn’t gone through it,” Duarte concluded. “I feel like this story and the SFNS is going to be something I carry with me for the rest of my life. I have already seen the doors that can be opened and I plan to continue taking advantage of every opportunity presented to me,” Valdes said. Bárbara Corbeline Duarte, in my opinion, deserves the front page of the Miami Herald. She´s goint to be a vere clever and outstanding journalist.